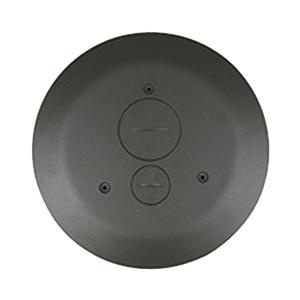 Wiremold Flush furniture feed poke-thru device in black color, is suitable for use on tile or carpet floor. It features die-cast aluminum cover construction and powder-coated finish for longer endurance. It measures 8-1/4-Inch Dia x 9-11/16-Inch. This flush furniture feed poke-thru device with junction box, has one 3/4-Inch and one 1-1/2-Inch conduit knockouts. Device is UL listed.